There are different kinds of sugars. “Glucose” is what our body utilizes most. Other sugars we eat, like fructose from fruit or lactose from milk, are converted into glucose in our bodies and use them for energy. Our bodies also break down starches, which are sugars stuck together, into glucose. Serum glucose is transported from the intestines or liver to body cells via the bloodstream and is made available for cell absorption via the hormone insulin, produced by the body primarily in the pancreas. Insulin is secreted by the beta cells of the islets of Langerhans in the pancreas in response to elevated level of blood glucose. This pancreatic hormone facilitates the movement of glucose across the cell membranes to be used for metabolic activity. The alpha cells of the islets of Langerhans secrete glucagon when blood glucose levels are low. Hyperglycemia or elevated blood glucose levels may occur in a variety of clinical situations. Diabetes mellitus is the most common disorder associated with elevated blood glucose levels. Certain drugs have hyperglycemia as a side effect. Hypoglycemia, otherwise, occurs most often as the result of excess insulin administration in the person with diabetes mellitus. It may also occur to a person who has excessive alcohol intake, prolonged fasting and starvation states, adrenal insufficiency, and eating disorders such as anorexia nervosa. Low blood glucose levels after meals may be linked to gastric bypass surgery or excess consumption of refined carbohydrates and is the result of increased insulin production. An important part of managing blood glucose levels, as well as the overall health of a person, is maintaining a healthy weight through a healthy diet and exercise plan. Patient has a blood glucose reading of less than 180 mg/dL; fasting blood glucose levels of less than <140 mg/dL; and hemoglobin A1C level <7%. 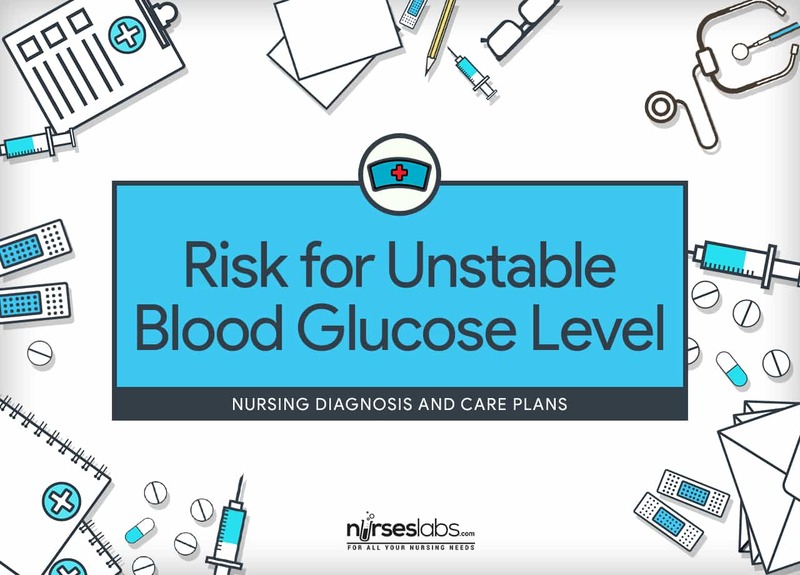 Assessment is important to identify potential problems that may have lead to changes in blood glucose level as well as handle any conflict that may appear during nursing care. Assess for signs of hyperglycemia. Hyperglycemia results when there is an inadequate amount of insulin to glucose. Excess glucose in the blood creates an osmotic effect that results in increased thirst (polydipsia), hunger (polyphagia), and increased urination (polyuria). The patient may also report nonspecific symptoms of fatigue and blurred vision. Assess for signs of hypoglycemia. Manifestations of hypoglycemia may depend on every individual but are consistent in the same individual. The signs are the result of both increased adrenergic activity and decreased glucose delivery to the brain. The patient mat experience tachycardia, diaphoresis, tremors, dizziness, headache, fatigue, hunger, and visual changes. Assess medications taken regularly. A lot of drugs can cause fluctuations in blood glucose as a side effect. Beta-blockers, corticosteroids, thiazide diuretics, estrogen, isoniazid, lithium, and phenytoin can cause hyperglycemia. Regular use of salicylates, disopyramide, insulin, sulfonylurea agents, and pentamidine can cause hypoglycemia. Monitor blood glucose levels as fasting and postprandial levels. Normal fasting blood glucose for an adult is 70 to 105 mg/dL. Critical values for hypoglycemia are less than 40 to 50 mg/dL. Critical values for hyperglycemia are greater than 400 mg/dL. Patients receiving total parenteral nutrition (TPN) may have a higher than normal blood glucose value because the solution contains up to 50% dextrose. Patients with reactive hypoglycemia will have a blood glucose level less than normal after eating. Assess blood glucose level before meals and at bedtime. Blood glucose should be between 140 to 180 mg/dL. Non-intensive care patients should be maintained at pre-meal levels <140 mg/dL. Monitor serum insulin levels. Hyperinsulinemia occurs early in the development of type 2 diabetes. Obesity and insulin receptor dysfunction in peripheral tissues stimulates insulin secretion from the pancreas. Insulinomas and some extrapancreatic tumors cause increased insulin levels and contribute to hypoglycemia. Assess for anxiety, tremors, and slurring of speech. Treat hypoglycemia with 50% dextrose. These are signs of hypoglycemia and D50 is treatment for it. Assess feet for temperature, pulses, color, and sensation. This is to monitor peripheral perfusion and neuropathy. Assess eating patterns. Nonadherence to dietary guidelines for a specific clinical condition can result in fluctuations in blood glucose. Assess the patient’s current knowledge and understanding about the prescribed diet. An individualized diet plan is recommended. Assess the pattern of physical activity. Physical activity helps lower blood glucose levels. Regular exercise is a core part of diabetes management and reduces risk for cardiovascular complications. Assess alcohol intake. Excessive alcohol consumption, without food intake, blocks release of glycogen from the liver, causing hypoglycemia. Assist the patient in identifying eating patterns that need to be modified. This information provides the basis for individualized dietary instruction related to the clinical condition that contributes to fluctuation in blood glucose levels. Administer basal and prandial insulin. Adherence to the therapeutic regimen promotes tissue perfusion. Keeping glucose in the normal range slows progression of microvascular disease. Refer to a registered dietitian for individualized diet instruction. An individualized meal plan depends on the patient’s body, weight, blood glucose values, activity patterns, and specific clinical condition. Modifications in the patient’s food intake will contribute stabilization of blood glucose levels. Administer insulin medications as directed. Insulin is required to lower blood glucose levels in type 1 diabetes, and for many patients with type 2 diabetes. Patients receiving TPN may require insulin to maintain stable blood glucose in response to high dextrose concentration in the solution. Report BP of more than 160 mm Hg (systolic). Administer hypertensive as prescribed. Hypertension is commonly associated with diabetes. Control of BP prevents coronary artery disease, stroke, retinopathy, and nephropathy. Provide food or other sources of glucose as directed for hypoglycemia. A rapidly absorbed form of glucose is indicated to manage hypoglycemia. These forms of glucose may include oral intake of hard candy or fruit juice. For the patient who cannot take something orally, intravenous injection of glucose may be indicated. Educate the patient about the importance of following a prescribed meal plan. A prescribed meal plan will help the patient maintain stable blood glucose levels. Educate the patient about the proper ways of taking prescribed medications. The patient with diabetes needs to learn about taking insulin or oral hypoglycemic drugs to lower blood glucose. Review the progress toward goals during each patient visit. Patient involvement in the treatment plan enhances adherence to treatment plan. Instruct the patient experiencing hypoglycemia about appropriate actions to raise blood glucose. Food intake is appropriate in most cases of hypoglycemia to raise blood glucose levels. Eating a rapidly absorbed source of glucose is appropriate for patients with diabetes. Discuss the importance of balance exercise with food intake. Exercise balances glucose levels by facilitating uptake of glucose into cells. The patient needs to understand the relationship of exercise, food intake, and blood glucose levels. Teach the patient on measuring capillary blood glucose. Capillary blood glucose monitoring provides the patient with immediate information about blood glucose. Instruct patient to carry medical alert information. The medical team needs to be able to identify the patient as having a clinical condition linked with unstable blood glucose. Refer the patient to an exercise physiologist, physical therapist, or cardiac rehabilitation nurse for specific exercise instructions. Specific exercises can be prescribed based on any physical limitations the patient may have.